'Star Jasmine' will smother walls, fences, structures and supports in beautifully fragrant, pure-white, star-shaped flowers all summer-long. As both a hardy and evergreen plant, it will provide year-round interest in your garden with gorgeous glossy green foliage all year embellished by beautiful flowers throughout the summer. Slow growng and easy to manage, it is ideal for climbing up pergolas, arches, trellises or tumbling over large patio pots and perfect for hiding unsightly walls and fences. Trachelospermum will bring an exotic touch to your garden and is hardy to approx. 5°C in the UK and can grow to 6m tall, making it a perfect choice for training up supports and structures. Supplied as estabished plant approx. 90-100cm tall on a cane, ready to plant out now. Need something to cover an unsightly wall, or add some attractive interest and height to your garden? This wonderful Star Jasmine is perfect! 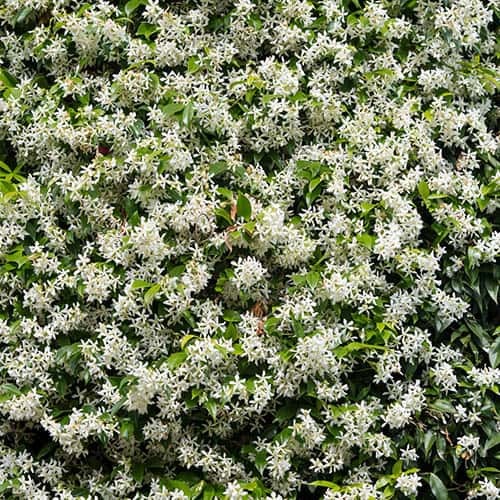 It produces waves of gorgeous pure-white star-like flowers across summer, each one with simply stunning fragrance! Evergreen and hardy down to 5°C,it will add year-round interest to your garden as the foliage changes from a rich purple in winter to a deep-green in spring and summer. Ideal for growing up posts, walls, arches and fences, and will thrive in a sunny, sheltered spot. Plant it somewhere where you'll be able to smell its incredible fragrant flowers! It is best grown against a warm, sunny wall in milder areas or in a greenhouse or conservatory in areas prone to severe frosts. Although it can reach up to 6m in a warm conservatory or greenhouse, it is relatively slow-growing in the garden, growing about 10-20cm per year in the UK, so it will not take over like other climbers. Supplied as a 90-100cm tall, 2 year old plant on a cane .